Mountain water, which contributes 50% to 90% to the lower reaches of the watershed, has a considerably low utility efficiency. The water accessibility could be a quantitative measure of water scarcity in the mountains. It can be used effectively for emergency water shortage planning and water resource management. 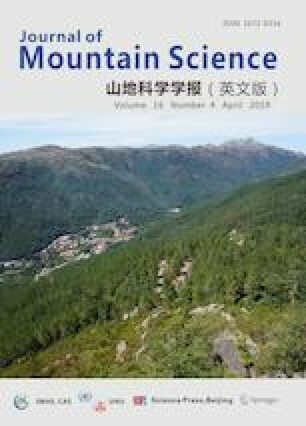 In the present study, Dongchuan District, a typical county in the Hengduan Mountains in Yunnan province of Southwest China, was selected as the study area, and the minimal cumulative resistance (MCR) model was used to simulate the least-cost path (LCP) from 1255 point features of natural villages, as well as 12,368 dryfield centroids, to their respective surrounding river systems, which serve as a source for emergency drinking water and irrigation during droughts. The average length of the LCP for each administrative village was calculated to represent the accessibility to water sources for agricultural production and daily life in these mountain villages. The distribution of population and dryfields, as well as other geographic elements, were analyzed to classify the degree of water scarcity in these villages. The results indicate that the area facing the highest risk of water shortage for agricultural irrigation is located in northern Dongchuan, in particular along the two sides of the Xiaojiang Valley, and that the area with the highest risk of water shortage for daily life needs is located along the Xiaojiang Valley. The study was financially supported by the National Program on Key Basic Research Project (973 Program) (Grant No. 2015CB452706).